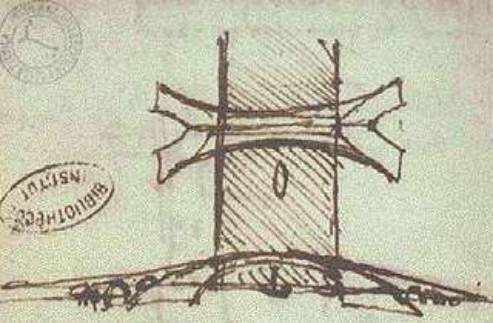 Leonardo da Vinci, THE GALATA BRIDGE - Manuscript L, folio 66 r - The drawing, which may be dated to between 1502 and 1503. This study presents experimental results of a turbulent neutrally-buoyant jet vertically discharged in a stagnant ambient and of the same jet discharged in a flow field of regular waves, in the intermediate range between deep and shallow water. Thermal buoyant jets in a very large channel with a vegetated bottom. The channel base covered a surface of 15 m by 4 m and the depth of the channel was 0.4 m.
Environmental problems have assumed an increasingly pivotal role in recent years. One of the problems which causes particular concern and is still subject to study is wastewater ocean outfall. While there are several studies in the literature on nonbuoyant and buoyant jets and their interaction with currents, few deal with jet-wave interaction. 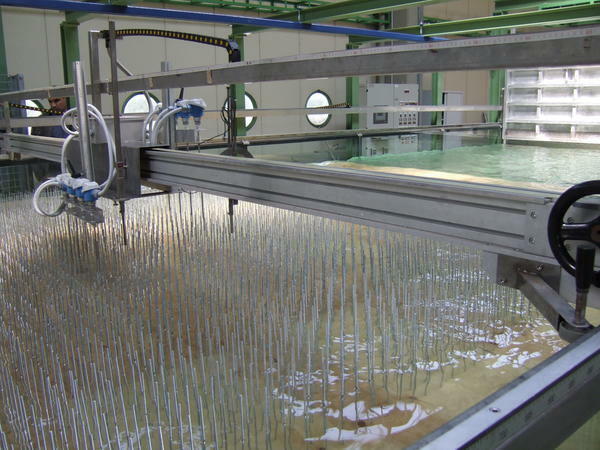 The majority of studies emphasizes the importance of a wave flow field in diffusion processes and the necessity of experimental tests to explain jet-wave interaction dynamics and possibly confirm the validity of mathematical models. Although stagnant ambient conditions are of interest, they are almost never present in real coastal environmental problems, where the presence of waves or currents is common. As a result, jets cannot be analyzed without considering the surrounding environment, which is only rarely under stagnant conditions. In particular, the study of jet-wave interaction still lacks experimental results. In this research topic we have observed that the interaction of a jet with a wave field motion does not cause equal effects everywhere, but everything is subject to the wave field motion and that of the jet (the interaction is subject also to the distance of the nozzle from the bottom). This study deals with this problem and shows experimental results of a turbulent non-buoyant jet discharged in a stagnant ambient and in the presence of a wave flow field in order to compare both situations and to experimentally analyze the behavior of different flow regions. Also the effects of both a corrugated and a vegetated channel bed on buoyant or momentum turbulent jets, vertically discharged into a crossflow, have been investigated. The major objective of this study has been the background turbulence, generated by the corrugated or vegetated channel bed surfaces, which affects the jet behavior (i.e. jet penetration, spreading, mixing performance, turbulent structures, etc. ).